Tulsa, OK community and factory workers pitched in to buy war bonds that would build a B-24 Liberator in the Douglas aircraft plant at the Tulsa airport in 1944. They named her Tulsamerican, took smiling pictures next to her and signed their names on her fuselage with messages and wishes to the soldiers she was flying to help. This B-24 was the last produced in Tulsa and it became a community icon. The aircraft flew to Europe and participated in missions across the continent until its defeat on December 17th, 1944. After surviving a dog-fight with Luftwaffe fighters the crew dropped their bomb load and the Tulsamerican limped home, badly damaged. The aircraft almost made it, but went into the water while circling an island emergency airstrip. Three crew members were lost and remain with the wreck site underwater. Seventy years later Tulsamerican rests in the Adriatic near Vis, Croatia. Vintage aircraft are quickly transitioning into the realm of “the past” and as such, archaeological methodology is valuable to document their wreck sites and understand the chemical changes that have been happening since their deposition. Archaeology hand-in-hand with museum exhibits showcases underwater wrecks as they can never be seen by most public, and promotes understanding and science-based learning. This project is a survey of Tulsamerican, and is specifically planned to obtain an accurate and vibrant 3D map of her wreckage. Secondary goals are to take corrosion potential readings from the Tulsamerican site and other B-24s in the area to interpret the decay of WWII aircraft sites in various depths. The images will be used to benefit the Tulsa Air and Space Museum & Planetarium and also for the PhD dissertation of the project’s leader. The desired outcome will be to help integrate Tulsamerican’s memory into the community of Tulsa and provide the museum with opportunities to honor her history. 2004 Stabilization of a Wrecked and Corroded Aluminum Aircraft. In Metal 04: Proceedings of the International Conference on Metals Conservation, J. Ashton and D. Hallam, editors, pp. 453–464. National Museum of Australia, Canberra, Australia. 1995 Stabilisation de Moteurs d’Avions Immergés. Studies in Conservation 40(1):10–18. 2011 From Sea to Sky: The Case for Aeronautical Archaeology. In The Oxford Handbook of Maritime Archaeology. Oxford University Press, New York. 2005 Archaeological Investigations of the World War Two Catalina Flying Boat Wreck Sites in East Arm, Darwin Harbour: An Appraisal of Results. Darwin Archaeology: Aboriginal, Asian and European Heritage of Australia’s Top End: 85–95. 2007 Working Backwards: Broome’s World War II Flying Boat Wreck Sites Reconstructed from Archaeological Non-Disturbance Surveys. Bulletin of the Australasian Institute for Maritime Archaeology 31:32. 2004 Stabilization of Corroded Aluminium: The Bertram Seaplane Float. Western Australian Museum. 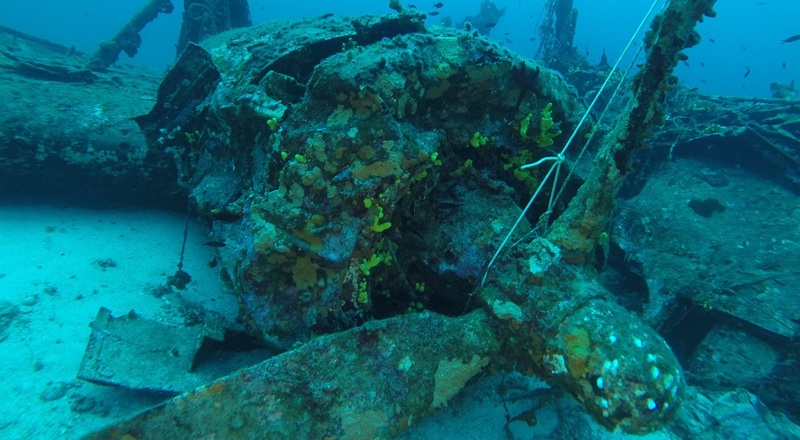 2014 In-Situ Corrosion Studies of Wrecked WWII Aircraft in Saipan, Commonwealth of the Northern Mariana Islands. Melbourne, Australia. 1997 The “Black Cats”- Report into the Feasibility of Locating, Raising and Conserving One of the Four Lend-Lease PBY Catalina Flying Boats Scuttled off Rottnest Island in the Years 1945-1946. Department of Maritime Archaeology, Western Australian Maritime Museum. 2004 Historic Aircraft Wrecks as Archaeological Sites. Bulletin of the Australasian Institute for Maritime Archaeology 28:81–90. 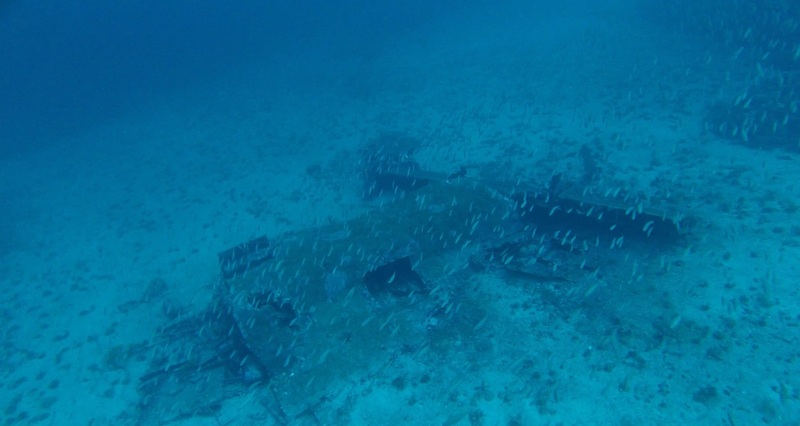 2014 Management Plan and Public Outreach for WWII Submerged Resources in Saipan. American Battlefield Protection Program. 1998 The Lost Flying Boat of Kaneohe Bay: Archaeology of the First U. S. Casualties of Pearl Harbor. Historical Archaeology 32(4):8–18. ABOVE: Tail Section (Photo: Megan Lickliter-Mundon).